EAC’s cyber chapter, the Virtual Threads, facilitated round robin samplers for willing participants in 2015. 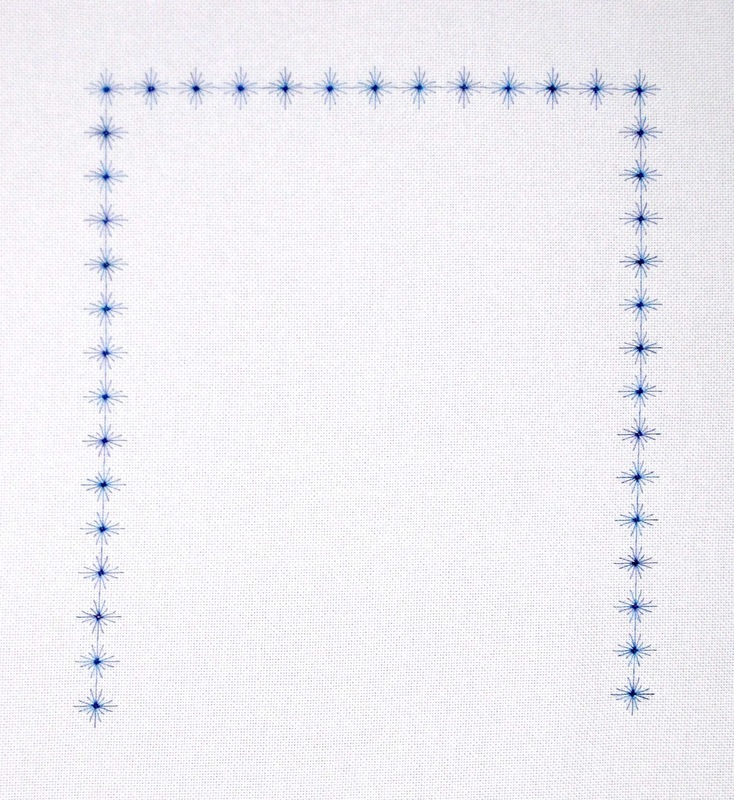 There was a counted thread one and a surface stitchery one. I, of course, wanted to do the counted thread. 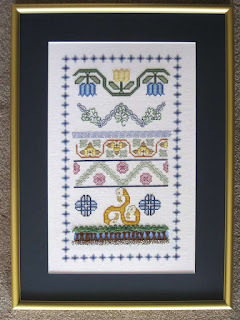 Read on about the additions to my sampler and to see the final picture. With each piece added, the stitcher wrote about it, and I am relaying their words, with their permission. I’m sure other stitchers will be able to identify with our words. My base fabric is 25 count Lugana, colour Lavender Bliss. I chose the parameters by stitching eyelets for the top and side borders. I have left the bottom open so as not to limit anyone or to expect extra stitching to fill in the space. I will finish it after it comes back to me. I used DMC Colour Variations #4240 to stitch the eyelets and am enclosing it with this. Not that I expect you to use it, but you may find it helpful with matching threads and I will find it helpful to finish off the eyelets and not have to try to find it again in my stash! Stitch whatever you please. Looking forward to working on everyone’s pieces and seeing the final result! It took me a long time trying to decide what to stitch. First I was going to do black work but I couldn’t get the pattern to print. So I did a pattern from a 1991 EGA magazine I found while at Seminar last month. I used DMC floss in these colors. Greens 520, 522, 523. Gold 676, 677, 745 and blues 797, 953, 800. Hope you like it Carol. Blackwork leaves and celtic chain border. I wanted to try some blackwork motifs, but I wanted to add a twist. 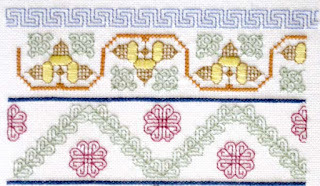 I love celtic knot designs, it reminds me that my stitching career started in Nova Scotia with the Marigold Guild. I found some folded leaf designs that I modified and overlayed on the chain border. The chain is DMC 336 crossed with JL Walsh silk perle floss 392. The leaves are Threadworx 11611 with veins of DMC 500. 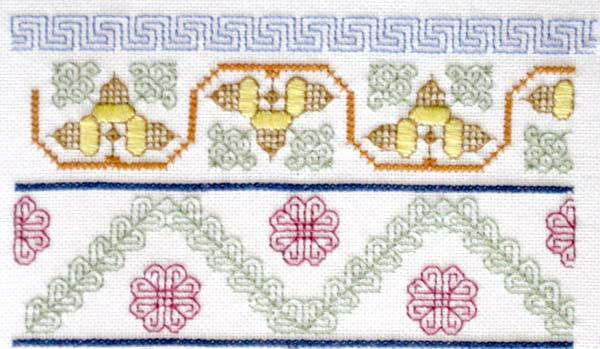 I thought these colours blended with the DMC 4240 eyelet border. After I had stitched the two design, I thought the contrast wasn’t quite ‘poppy’ enough, so I wrapped the leaves with an additional strand of the Threadworx. You didn’t say your intentions for the finished piece, but I hope you enjoy it. By the way, the trees are just gorgeous. Tough to find something as spectacular. Hi Carol! I hope you like what I added. I had a magazine I have been holding onto for about 20 years – Linen Quarterly – Fall 1990 – because I loved these sampler bands. Finally, a chance to stitch them! 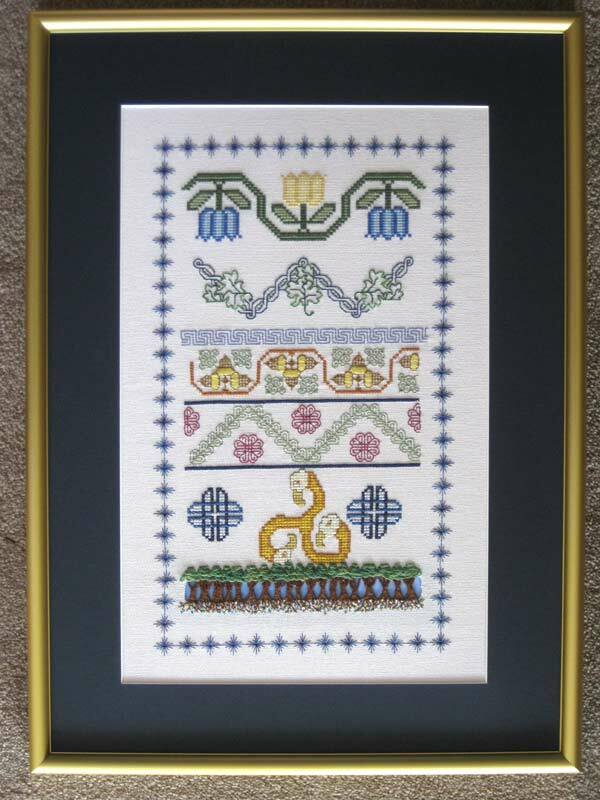 My stitching goes from the blue Greek key band down to the blue long-armed cross stitch under the red floral motifs. Colours used: DMC 3807, 523, 3803, 336. Sorry, the other skeins grew legs and walked away before I got to write down the #’s. 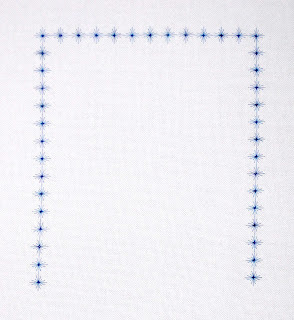 I’ve stitched under the blue bar. Two celtic knots and a triskele. When Fran receive the piece, she decided, very wisely, not to add to it. She sent an e-mail saying: I have looked at your round robin piece and there really is no place for me to stitch on it without spoiling the overall effect. And now, the completed piece! I think you’ll agree it’s gorgeous! Lucky me! !